The producers of The Conjuring are it again! This time, they have put out The Curse of La Llorona. Of course our love of horror and those involved meant we had to create a recipe! We came up with a recipe for Cursed that is sure to impress as well as scare! “This timeless Hispanic legend comes to terrifying life in “The Curse of La Llorona.” La Llorona. The Weeping Woman. A horrifying apparition, caught between Heaven and Hell, trapped in a terrible fate sealed by her own hand. The mere mention of her name has struck terror around the world for generations. In life, she drowned her children in a jealous rage, throwing herself in the churning river after them as she wept in pain. Now her tears are eternal. They are lethal, and those who hear her death call in the night are doomed. La Llorona creeps in the shadows and preys on the children, desperate to replace her own. As the centuries have passed, her desire has grown more voracious…and her methods more terrifying. When creating our Cursed Cookies, we really wanted to explore the cultural flavors of Mexico without just recreating a Mexican food dish. To accomplish this, we focused on celebrating the region of Central Mexico and its people. La Llorona has some basis in Aztec storytelling, therefore our cookies do as well. The Aztecs were among the first to make and drink chocolate for thousands of years before it was discovered by the old world. The origin of the word chocolate comes from xocolatl (bitter water), from the ancient Aztec language, Náhuatl. With all of the cookie recipes of this nature already online, we decided to go a step further. 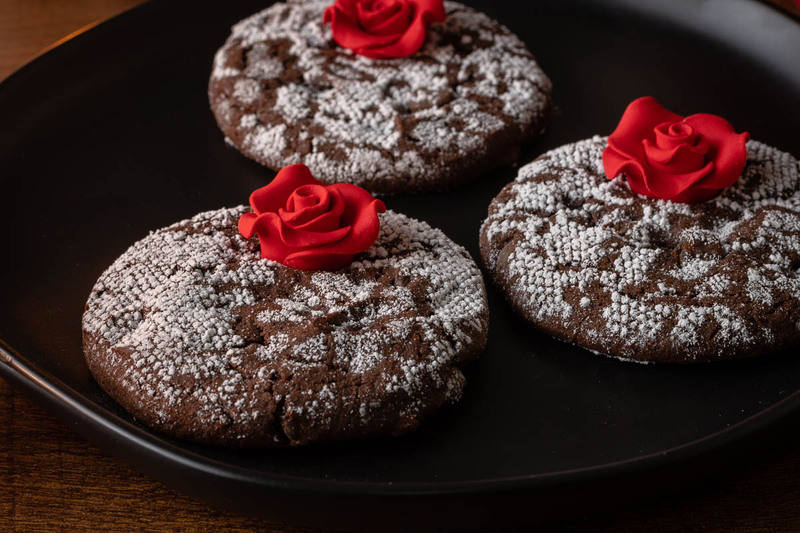 We used lace to create a powdered sugar design on the cookies reminiscent of La Llorona’s dress. We also added a rose as it is a major part of the iconography of the film. 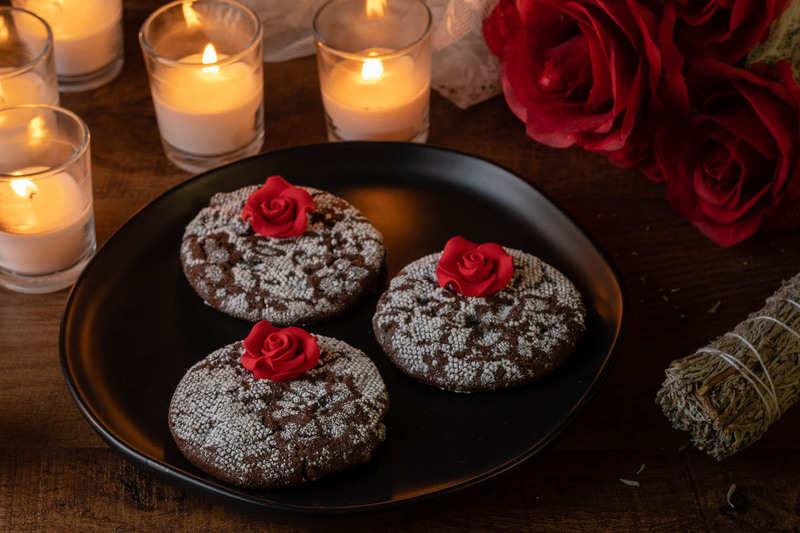 Are you brave enough to not only try these cookies but also see the film that inspired them? We are giving away 15 pairs of VIP Advanced Screening Passes to an advanced showing of The Curse of La Llorona! The showing will be held at Harkins Tempe Marketplace on Monday, April 15th. The screening starts at 7 pm and the winners should arrive at 6:15 in order to guarantee their seating. Winners will be selected on Saturday, April 13th. Good luck! Are you ready for the scares of The Curse of La Llorona? The Geeks have created a spooky and delicious recipe for Cursed Cookies inspired by the film. Bake cookies per recipe instructions. Using your sifter or strainer, sprinkle with powdered sugar from at least 6 inches above the cookies. Carefully lift the lace off of the cookies making sure to lift straight up. 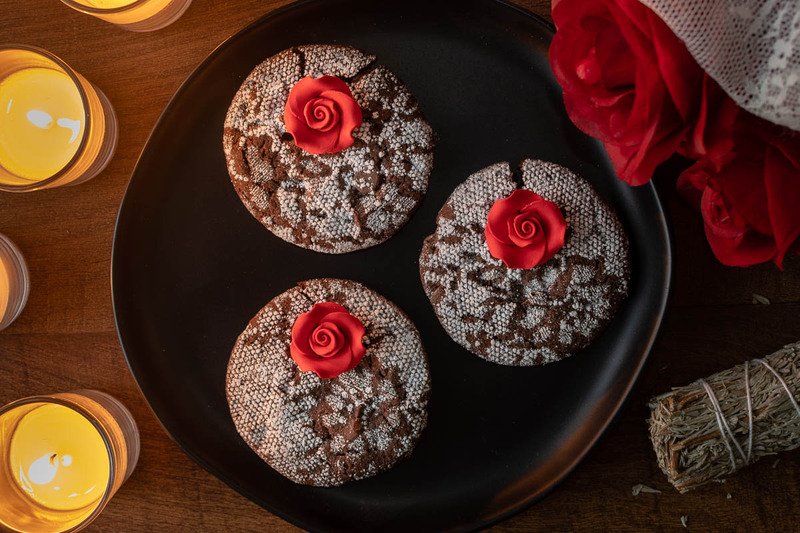 Press a rose into each cookie. These are stunning. What an amazing idea to use the lace as a template for the design – they turned out amazing!